I traveled to Greensboro, NC to see a friend of mine several years ago, kiddos in tow. I’ll never forget the first night we were there my girlfriend had gotten these salmon parchment packets from Whole Foods in Greensboro. She said they had all different flavors but she chose the Mediterranean one. 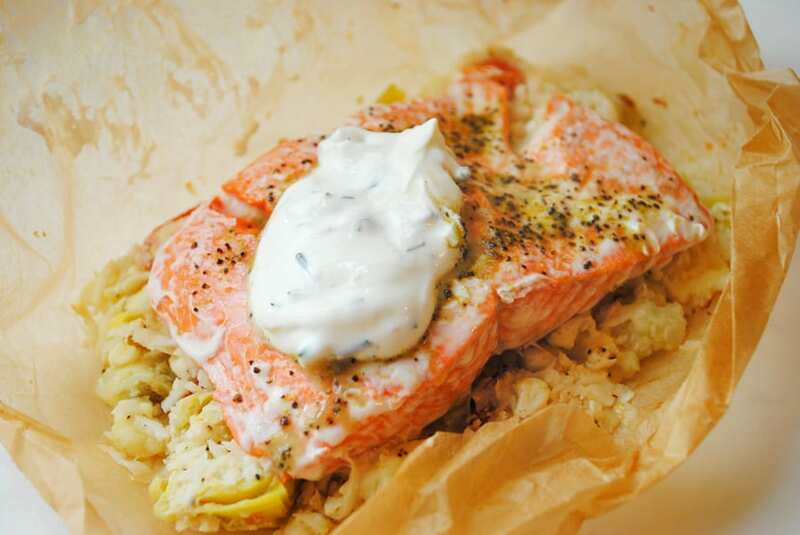 It was salmon cooked in parchment with a bed of rice underneath. Mixed into the rice was artichoke hearts, olives, feta cheese, and tomatoes. I loved how she just bought it from the store all ready to go and be cooked at home. And it was delicious! I came home and went to my local Whole Foods thinking they would have these awesome things too, but they all looked at me in confusion. They don’t carry that in the seafood department at my store, so it was up to me to make them. I’ll be honest, I did them with white rice, brown rice, and quinoa. All of them were okay, but when I finally tried it with the cauliflower rice that’s when I knew it was perfect. The cauliflower rice does need to be cooked but only for 8 minutes or so, making it perfect for these packets. 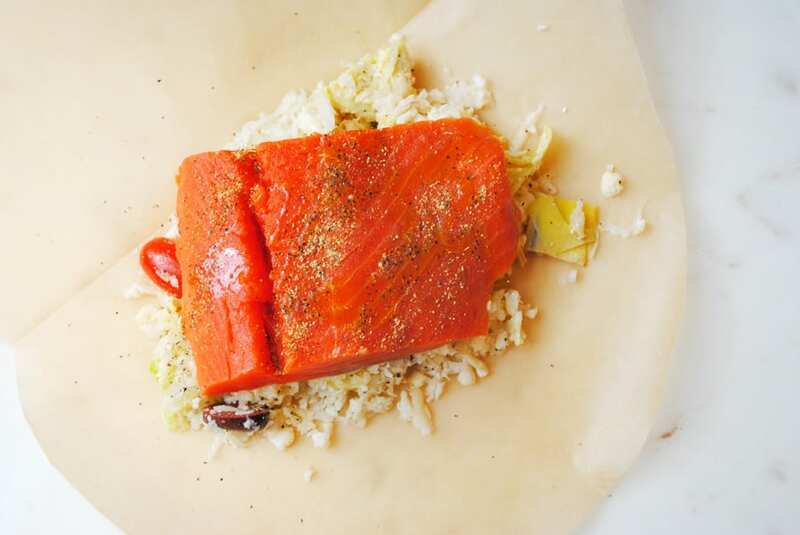 Instead of having to precook it like regular rice or quinoa, it can steam in the packets with the salmon. It cooks up with the salmon beautifully, and takes out a step in the cooking process. Not to mention the cauliflower rice is the perfect low carb substitute for regular rice. I tried cauliflower rice several years ago. I had gotten a frozen pack of it and it was awful! Too watery and runny, nothing at all like rice. I decided to try making my own and what a difference! It’s delicious, the texture is spot on and the flavor is so mild it goes with literally anything you pair it with. You can make the rice with the grater attachment in the food processor, or you can simply do it by hand with a box grater and a large bowl. I’ll show you how! 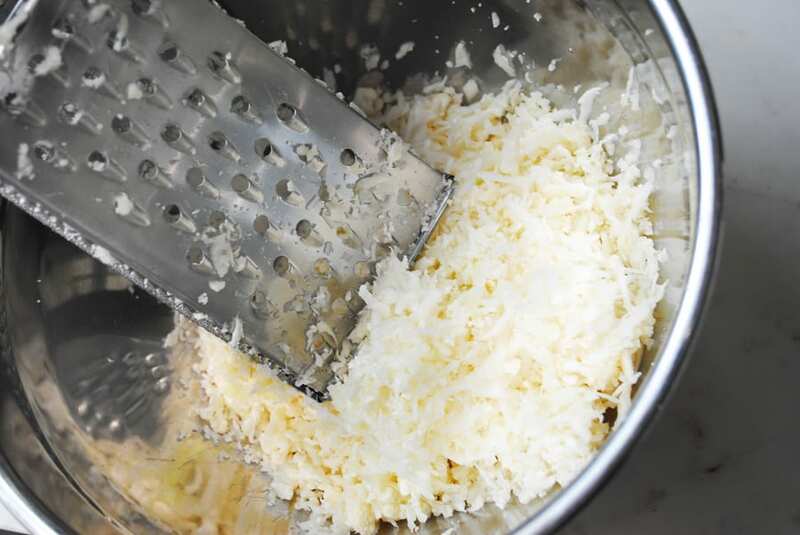 Grate the cauliflower with a box grater into a large bowl. The larger the bowl the better since this can get messy. I chop my cauliflower in half and grate each half. Some florets may dislodge just pick them up and grate them individually if necessary. 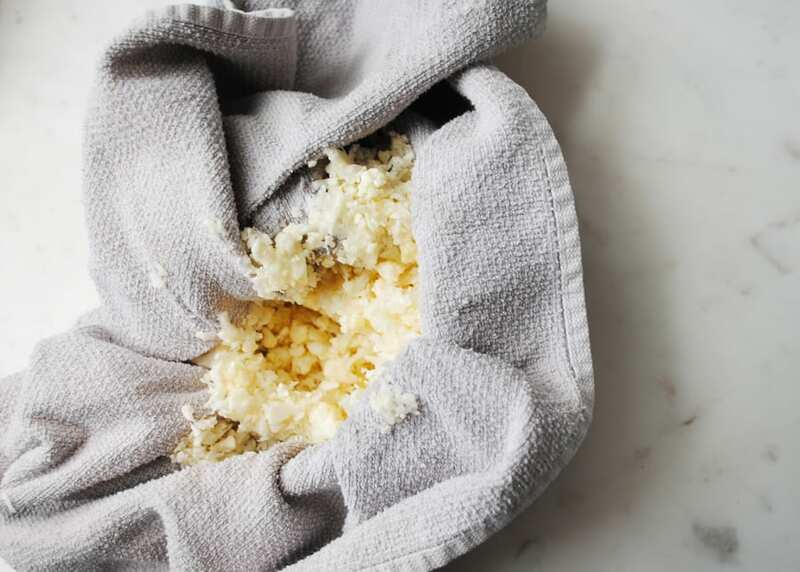 Then pour the cauliflower rice into a kitchen hand towel. I lay mine flat on the counter and put the rice in the center. Gather each corner of the towel up carefully so that the rice won’t come out when you squeeze. Twist the towel and squeeze the rice in the towel to get any excess moisture out. This is VERY important and keeps your rice from becoming watery and soggy. Pour the rice back into the bowl you grated it in and add in the ingredients for the Greek rice. Mix well and put into the parchment. To use this rice for OTHER recipes, simply put into a saute pan with a 1 tbsp olive oil and sprinkle with salt and pepper. Cover with a lid and cook over medium heat stirring occasionally for 8 minutes or so. Then serve. For this recipe you do NOT need to cook the rice before eating it. It will cook in the parchment. Now for the parchment. You can cheat and buy these at the grocery store. They work well and no cutting or folding is necessary. 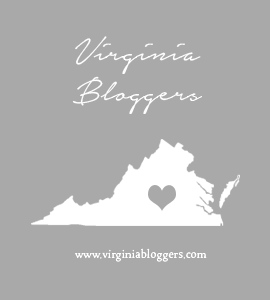 Or if you have parchment paper (and you should, literally NOTHING sticks to it, it’s WAY better for cooking and your health than aluminum foil) simply make a large paper heart with it. I love to use precut parchment paper sheets, but a regular roll is fine too, you need a piece about 12 x 16 inches. Fold the paper in half on the 16 inch side, so each folded rectangle is now 12x 8 inches. Then cut out a heart shape like you used to do in school. Make the heart as large as possible. Open the heart and on one side place 1 C of the greek cauliflower rice, 1 skinless salmon fillet, drizzle with olive oil and seasoning. Fold the heart over, and starting the rounded edge start folding the parchment edge onto itself, tightly. There is no exact science to this, just fold and crimp it closed. Then as you get to the pointed end of the “heart” fold the point back on itself and continue to crimp the heart fully closed. It should be a half circle. Congratulations! You’ve done it! These can be kept in the fridge overnight. Or you can heat them up right away. 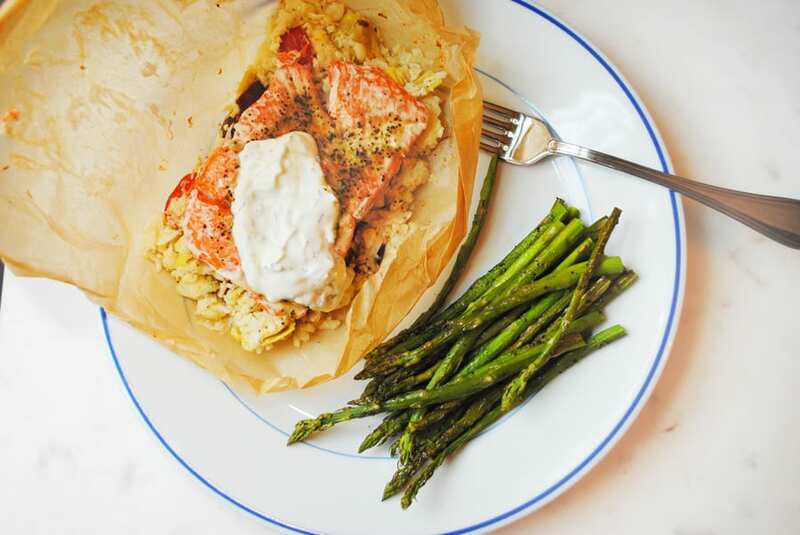 Light and deliciously healthy this low carb cauliflower rice cooks up with the salmon in each parchment packet. 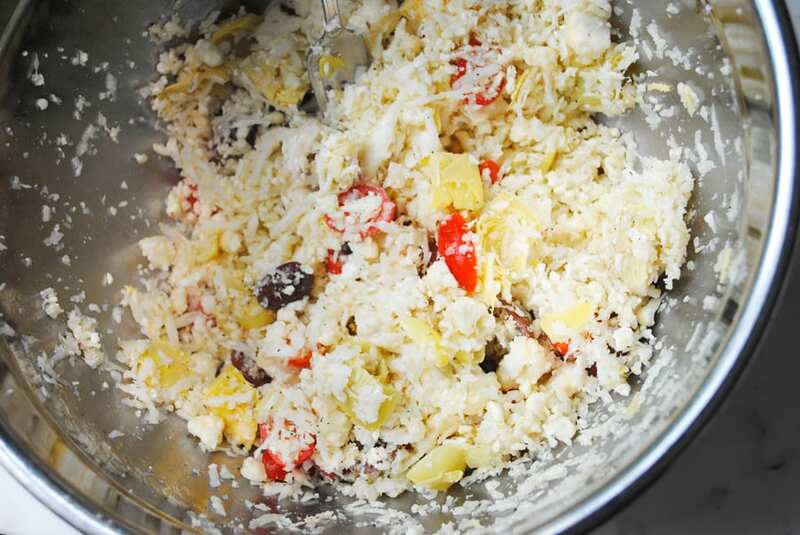 Place the cauliflower rice into a bowl and mix it with the tomatoes, olives, feta, artichokes, and greek seasoning. 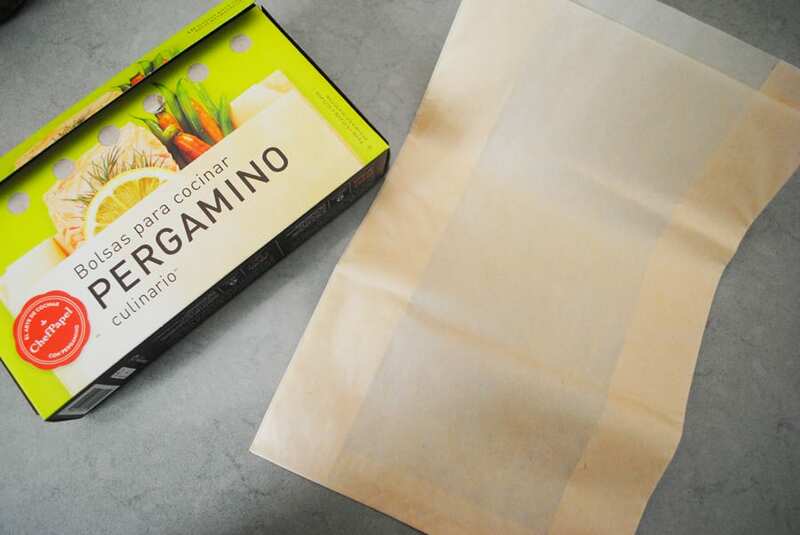 Lay the rectangular parchment paper on a countertop. Fold the parchment in half on the long side. So it should make a folded 8 x 12 inch rectangle. Starting at the folded edge cut out a very large half heart (as large as you can make it) just like you used to do in elementary school. A large rounded top coming into a point, so then when it's opened it is a large heart with the center line of the heart being the folded side. Put 1 C of the cauliflower rice mixture into the center of one side of the heart. Pace one of the salmon fillets on top and drizzle the salmon with a little olive oil. I like sprinkle additional Greek seasoning on top or you could use salt and pepper. Fold the other half of the heart on top of the salmon. Then on the rounded edge start crimping and folding the paper closed working your way around the pointed edge. When you get to the side, fold the point over on itself and continue to fold it closed. When you are done it should be a half circle. 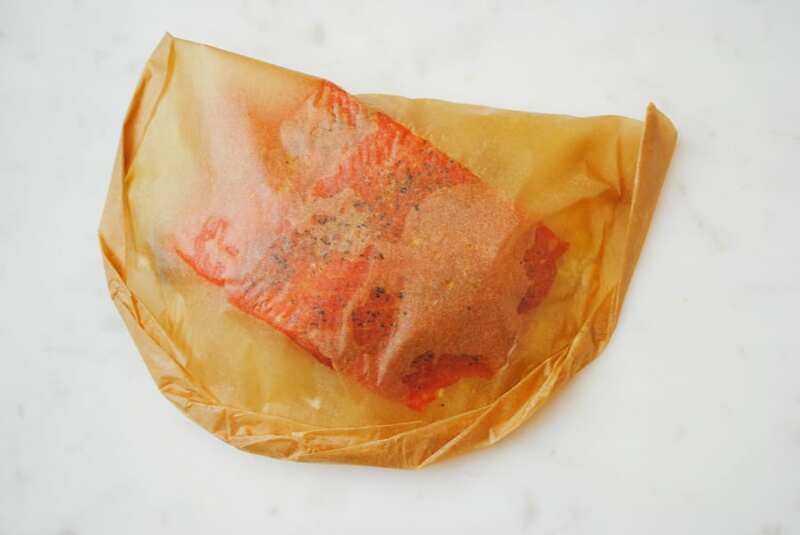 Continue to do this with the four other parchment packets and salmon fillets. 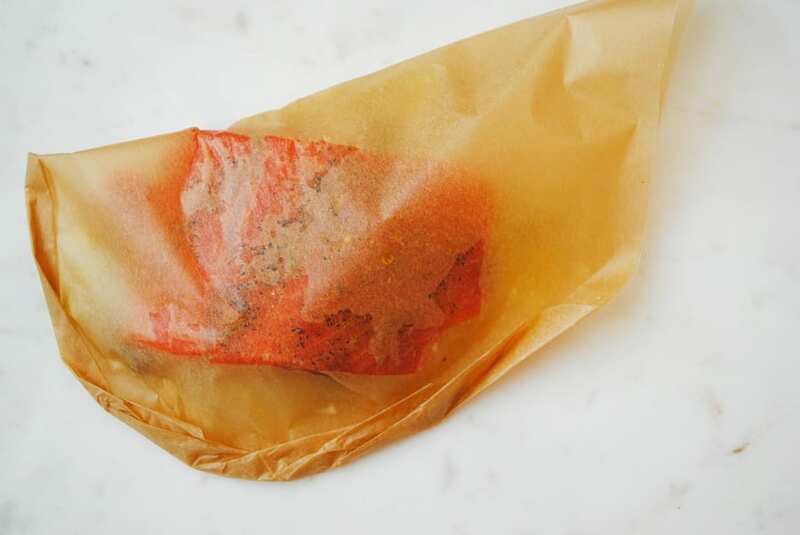 Place the parchment packets on a baking sheet and place in the center rack of the oven. Cook for 15-20 minutes. The thicker your piece of salmon, the longer it will take to cook. I usually sacrifice one of the packages by opening it up and checking the doneness with a fork. It should flake but only just so. 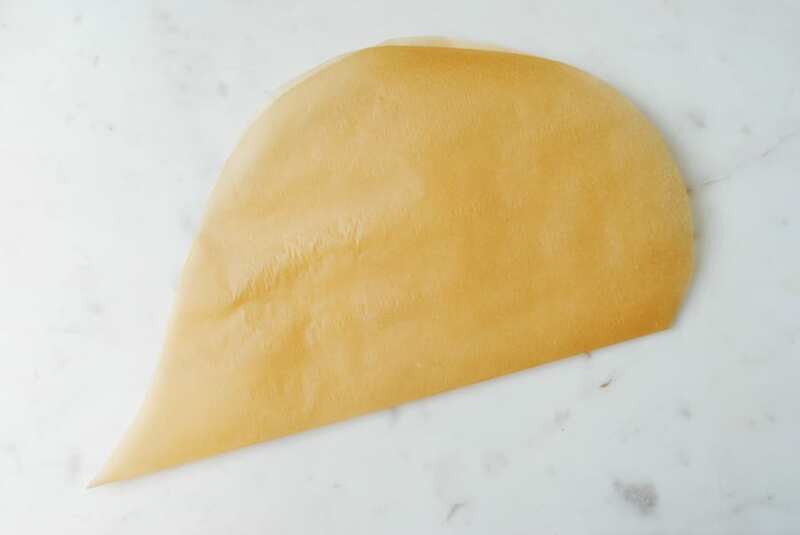 Serve each parchment packet on a plate. Allow your guests to open their own packet. I like to serve mine with a dollop of Tzatziki. This was AMAZING! We made it for dinner tonight and I could not be more happy with it. I’m already excited (and planning) to make it again...soon! I’m so glad you enjoyed it! It’s one of my favorites too. And super healthy for you!